Sony say that the Alpha 100 has a 230,000 pixel rear screen and the Alpha 700 has 920,000 pixels. What they don’t make entirely clear is how many individual R, G or B pixels are used to create each ‘pixel’ of the image (complete RGB). In fact the 920,000 pixel screen is VGA – 640 x 480 – in display resolution, which is 307,000 pixels not 920,000. What is going on? We took some macro images to show you. First of all, beware third party (that is, all) Alpha to M42 thread adaptors! I knew that the Chinese made adaptor I have on my macro bellows was tight on the Alpha 700 because of the larger camera lens mount flange. I have fitted it without fully turning it home, just enough to be secure. This time something went wrong and it jammed solid on the Alpha 700. I had to use a pipe wrench to remove it, and that’s not something you want to be aiming at an expensive DSLR. No harm was done apart from a very small mark on the body flange. The pictures are taken with full bellow extension of 10cm with a 25mm f2.5 Minolta Micro lens, hand-held with SSS on the Alph 100. The rig is actually firmly held on to a desktop with the target camera screen in front on the same desk. This proved easier than setting up tripods. The micro lens is used at f4, which may seem odd, but it actually gives good sharpness at wider apertures. There is very little depth of field. The focusing is so unpredictable I set the subject at an angle to the camera, and then select the zone which best shows what I was aiming for by making a small crop (1200 x 800 pixels) from the full frame. This is the Alpha 100 screen photographed at roughly 6X magnification plus the 1.5X factor, equal to around 9X magnification on 35mm film, then enlarged a further 3.23X by cropping, so what you see on screen here (click on the image for the full 1200 x 800 size) is equal more or less to shooting on 35mm film with 30X magnification and making a 7 x 5 inch print. The actual area you are looking at is just over 1mm of the screen (around 1.2mm). 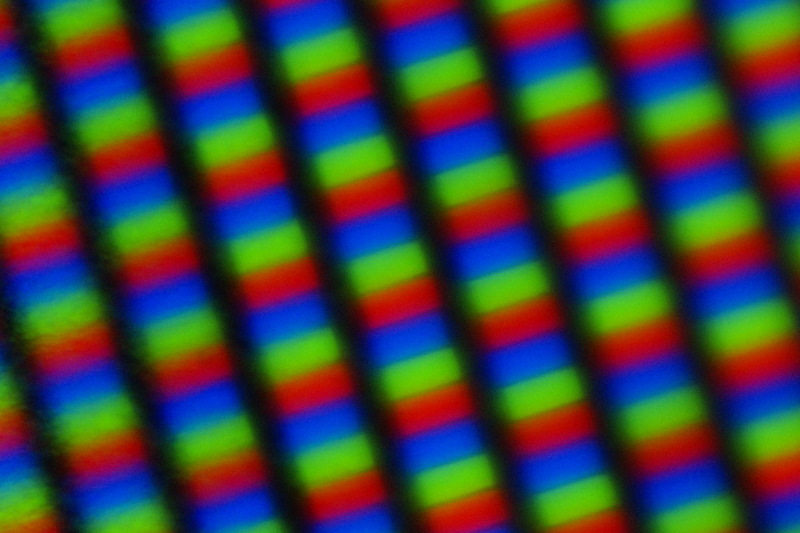 The cover of the Alpha 100 LCD is slightly textured plastic, and acts to diffuse the sharpness of the pixels slightly (you can just see the wrinkly texture coming into focus on the left side of the shot). Each RGB pixel consists of three horizontal subpixels and the vertical rows are staggered by half a pixel pitch to create regular lattice patterns of red, green and blue. Here, at exactly the same repro ratio, is the Alpha 700 screen. You can see immediately that there really are 920,000 pixels but for every colour block, two pixels each of R, G or B make up the array. Each image pixel locus consists of six pixels instead of just three, and there is no staggering of the vertical lines to create an even pattern for each colour. You see the image divided into horizontal lines of colour instead. The cover sheet though it does not look very different to the eye has no texture, and the micro lens can see the tiny diodes clearly. But is Sony counting two of these pairs pixels as one? Or does the entire block of RGB count as one pixel? It looks as if they count the twin pixels as a single item, because they are not independently controlled (each pair, or divided pixel, has only one brightness value). VGA resolution is one-third of 921,000 pixels. The Alpha 700 screen has both a finer pitch than the A100, and larger size. The active screen area is 6cm x 4.5cm and the rows of pixels shown here do work out at around the size expected – a pitch of 106 dpcm, 270dpi, based on the vertical black lines. Each group of 3/6 dots seen here forms one true pixel of 307,000 but Sony is quoting 921,000 based on R G and B being considered pixels in their own right. Now see how this really compares with the Alpha 100, overlaid on the Alpha 700 at exactly the same scale. 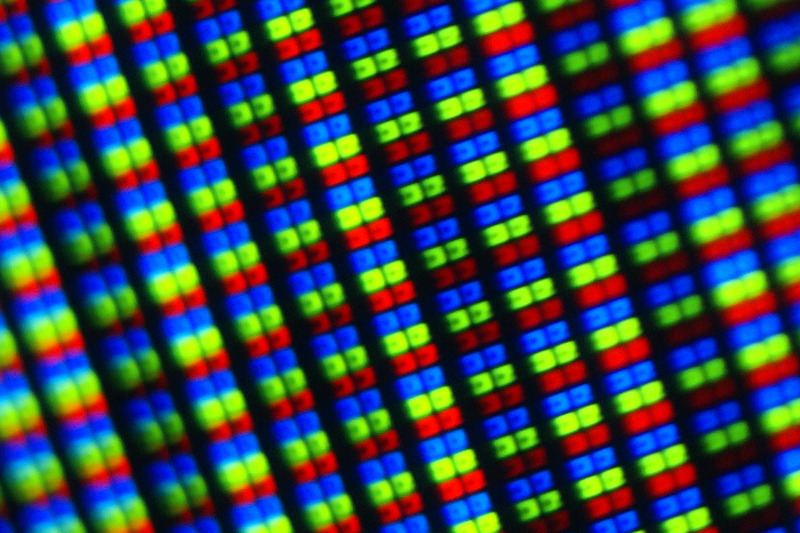 Fifteen subpixels of the A700 screen equal about the same as three subpixels of the A100, which matches up well to 4X the resolution (920k versus 230k) allowing for differences in the support structure. The Alpha 100 screen is about 5cm x 3.75cm. The pixel pitch is 11:7 of the 700, or about 68dpcm/170dpi instead of 270dpi. The resolution appears to be around 320 x 240, which is really only 77k pixels – or 230,000 if you, again, count R G and B as ‘pixels’ instead of considering the whole group to form one pixel. Confusion has been caused by claims that the way Sony calculate the pixel count of the 920,000 pixel screen is different from the way they expressed it for the 230,000 pixel predecessor. I was told this right from the start, including a claim (by Sony) that the pixels on the Alpha 700 were ‘true RGB’ and not a pattern – that they were a bit like the Foveon sensor, R G and B stacked in one location. They certainly are stacked, but in rows. Perhaps the pitch is now so fine that the eye sees the RGB locations as single pixels. One thing is certain, the difference between the Alpha 700 screen and the earlier Alpha 100 is considerable, and these images show what the eye can not easily distinguish. Hey David, interesting, as I was just taking shots of the pixels on one of my 17 inch monitors two days ago… Anyway, it is too bad you did not find a hack to adjust the tint on the screen to makeup for the anti-reflective coating making the yellow tinge! If I remember correctly, the Minolta A2 used a sort of similar pixel count on the Konica Minolta A2 viewfinder, saying it was a whopping 922,000 pixels. The A700 is simply amazing me even at top ISO! If you want to view some 100% crops of those money shots then just click into the review gallery, and then enter the ISO 6400 sub-album.